Janet was nominated for the Jeanne Clarke Local History Awards. The following is a review written by Myta Blacklaws, the Local History Committee Chair. 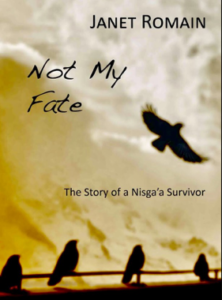 I am delighted to introduce “Not My Fate: The Story of a Nisga’a Survivor” written by Northern BC author Janet Romain and published in 2016. 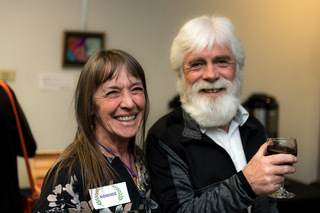 “Not My Fate” is Janet’s telling of the courageous story of Josephine Caplin (also known as Jo) as she journeyed through life in Northern BC from Prince Rupert to Endako, Fort Nelson and places in between. Jo was born a Nisga’a citizen, yet lived off reserve throughout her life. Her story is at times uncomfortable as it explores the many traumatic experiences and barriers that she faced as she strove to determine her own fate. Yet this woman’s strength, bravery and unending resolve to not only survive but also to thrive inspire and captivate the reader as they share in her successes and triumphs. This story is poignant and pertinent in our current societal climate of the Truth and Reconciliation process. 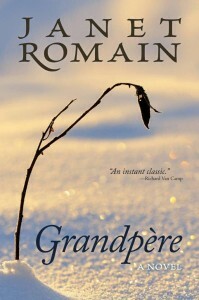 Through Janet’s telling of Jo’s experiences important topics such as residential schools, alcoholism, child protective services, adoption, Northern BC pipelines and the Idle No More movement are broached, compelling the reader to engage not only in Jo’s personal story but also in the larger realities of these subjects. This memoir is both personal and political in its intonation and will serve as a testament to current and colonial occurrences in the years to come. Photo by Kelly Bergman of Janet at the Awards Ceremony. Although she didn’t win she was honored by the nomination.